Pluto flyby: Scientists amazed as New Horizons data and photos arrive. This is it: We’ve made it to Pluto, and what a fascinating place it is. Tuesday morning’s true-color, full-disk image taken by the New Horizons probe is destined to be the textbook image for decades to come, at least. It’s 1,000 times better than any image we could capture from Earth. 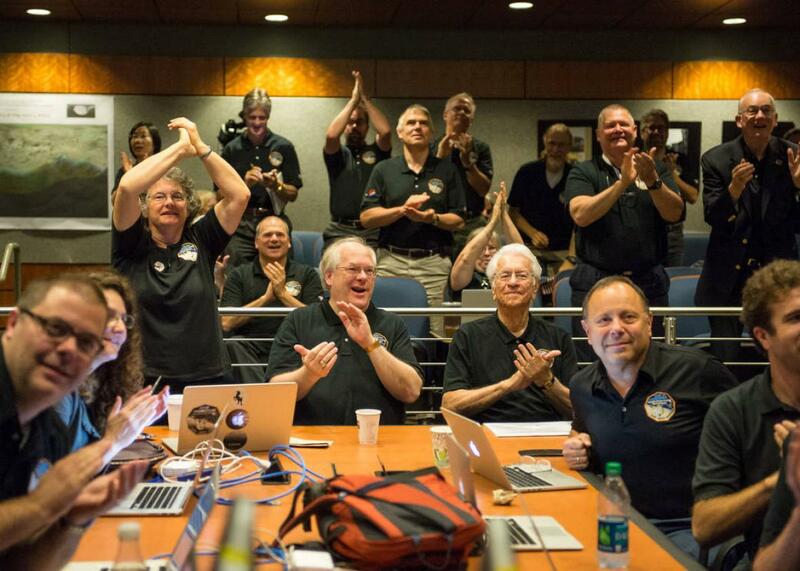 Members of the New Horizons science team react to seeing the spacecraft’s last and sharpest image of Pluto before closest approach later in the day, Tuesday, July 14, 2015 at the Johns Hopkins University Applied Physics Laboratory (APL) in Laurel, Maryland. And there’s nothing better than excited scientists. The mission’s principal investigator, Alan Stern, said the moment was a historic one for all of humanity. “We have completed the initial reconnaissance of the solar system,” Stern said at a NASA press conference. In that proud moment, some scientists waved American flags and chanted “USA!” though many noted that this was an international effort, and the atmosphere in the room was more like a giddy sleepover than a display of American scientific triumph. Still, our exploration of Pluto includes a distinctly American story—it was discovered in 1930 by Clyde Tombaugh, who grew up in Kansas. The New Horizons spacecraft carries some of his ashes. 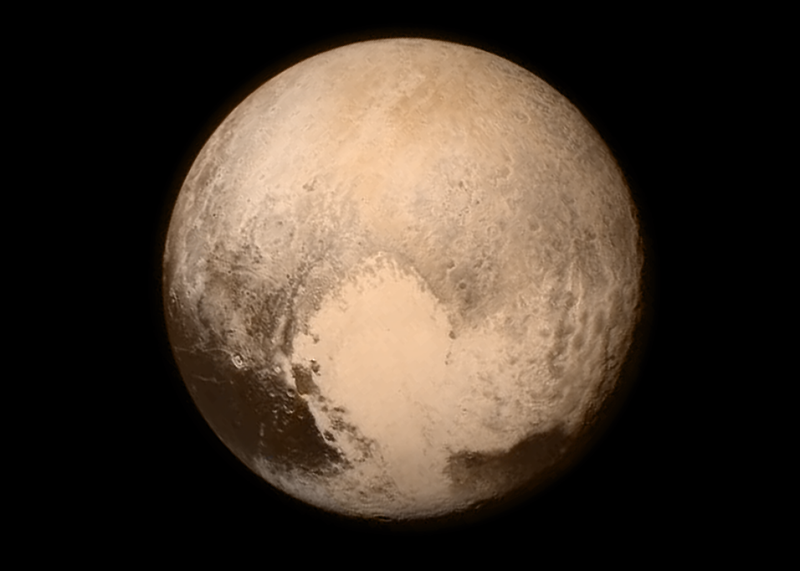 Hey so is it too early to suggest that the big heart on Pluto -- whatever it turns out to be -- be named Tombaugh? Slate’s Phil Plait already posted his initial thoughts, and he will be writing more throughout the week as data streams in. The first emotional, sleep-deprived impressions of the image from other Pluto scientists were full of questions, but immediate interest centered its prominent heart-shaped bright patch. The brown stuff at the equator really, really reminds me of Iapetus; but then what the heck is the "heart" -- what is it doing there? At the left side of the disk are a lot of linear features -- it's not clear to me at the moment what those are. The bumpy area at the right side of the disk is really striking. I can't think of an analog for that. As much as the bright terrain looks boring at that scale, it really is the most bizarre. I'm glad our highest resolution stuff is it. The spacecraft’s closest approach to Pluto came at 7:49 a.m. Eastern time Tuesday, but it’s so busy and so far away, we won’t get the really high-resolution stuff until later in the evening. New Horizons is actually officially out of Earth contact for most of Tuesday as it focuses on data collection. Stern and his team are eager to catch a glimpse of the “I survived” signal expected about 13 hours after its closest approach. Since Pluto will be mostly in shadow after the probe’s closest approach, the flyby images themselves will be detailed strips with 10 times the resolution of Tuesday morning’s image and extremely interesting to scientists, but probably not as stunning as this one. In one planned image, Pluto will appear as a thin crescent with the Earth and the Sun as distant points of light. The high res stuff will sweep across the left side of the heart and the crazy circle thing that I want to know more about! The part of NH I’m most excited for is the occultation data from Alice. It well tell us whether Pluto has haze. And how much. Q: When can we go back to Pluto? Alan Stern: I've secretly been working on a lander.